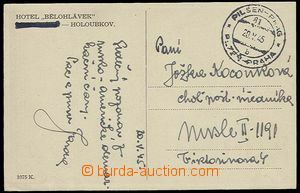 1945 unfranked postcard (Holoubkov) with print Bohemian and Moravian train post č.81b PLZEŇ - PRAGUE/ 20.V.45, according to text sent from Soviet - American demarcation lines. Without damage. 1907 GERMANY letter addressed to to Czechoslovakia as poste restante with railway pmk Cassel - Oberhausen / Zug 189 / 5.7.07, on reverse arrival . Without damage. 1908-15 GERMANY 2 pcs of Ppc with railway pmk Zug 456 DRESDEN - BODENBACH/ 2.5.15 and Zug 755 COBURG - LAIBACH/ 12.4.08. Nice print. 1913 OBER GOSTITZ single line postal agency pmk over the stmp + by hand 18.XII.13, as arrival postmark incomplete print Postal Agency WEISBACH. 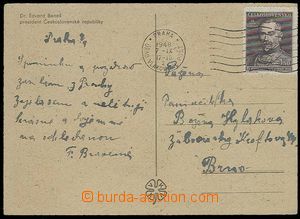 1917 postal-agency TURSKO (Libšice n. Vlt. ), violet, CDS Libšice n/Vlt./ 4.IX.17, nice, B/W postcard Turska, municipal off. 1924 - 36 7 pcs of entires with postal agency pmk S. JAN P. S., NEMOJANY, ČERCHOV, MACOCHA, ČERVENÁ HORA, JEŠTĚD, STUPAVA. Various quality copy-print. 1930 - 37 3 pcs of ROUDNÁ (Mysločovice), LADOVÁ JASKYŇA (Ztratená), BENECKO (Jilemnice). Nice print. 1941-43 3 pcs of Ppc with postal agency pmk RAABE, KRUMPISCH, BRÜNNLES, all franked with. with CDS Hohenstadt. 1x nice postcard swimming pool in/at Brníčku. Without damage. 1944 German postal agency pmk LITTENGRÜN über Falkenau (Eger) on envelope sent as printed matter franked with. 2 pcs of stamp. A. Hitler 4Pf, CDS Falkenau 20.7.44. 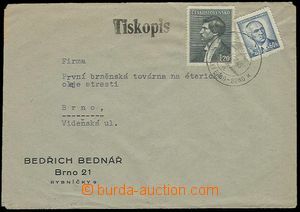 Superb postal imprint, envelope with small damage. 1876 forerunner of perfins - PC 2 Kreuzer "yellow", Mi.P18 with commercial embossed print Elias Old / Wischau, CDS Wischau 7/3 + arrival postmark Brünn 7/3 76. Decorative! 1897 PC 2 Kreuzer, Mi.P74, with additional-printing on reverse firm S.Polaczek and perfin in L corner PC S.P., Maxa S40, CDS Reichenberg 7/2 97. Without damage. 1898 commercial PC Bros Perutz with 2 Kreuzer with perfin B.P., Maxa B67 with CDS Prague 1/ 1/12 98. 2x bend corner, light spot in/at perf, good condition. 1919 CDV7 with uprated by. for postal rate II, stmp Pof.3 with perfin W.B. Maxa W9, MC Brno/ 3.VI.19, on reverse additional printing invoice and mounted revenue 10h, interesting combination, good condition. 1919 parcel dispatch card segment with 2x 120h Legionaire, Pof.32A + stamp. with perfin "..D.&J." (?) 40h Hradčany, CDS Wiesenthal a.d. Neisse 30.X.19. 1919-20 3 pcs of cuts post. dispatch-notes franked with. Hradcany-issue stamp. with perfins: J.B.S. Maxa J17, 2 pcs of CDS Staré Město n./M. F.S. Maxa F61, 2 pcs of, CDS Pardubice 6/2 19. G&co. Maxa G12 2 pcs of with CDS Würbenthal. Nice pieces. 1920 card firm on/for paper K.C. Menzel with 15h Hradčany with perfin K.C.M. Maxa K20, CDS Podolí u Bělé 1.I.20. Holes after/around archiving. 1921 card with additional-printing Reichenberger Messe with 10h olive Pigeon-issue with perfin RM Maxa R33, CDS Liberec 22.VI.21. Decorative, superb! 1922 heading envelope commercial fire-fighting corps f.. Herman Pollacka with 20h Pigeon-issue with perfin H.P.S., Maxa H41, CDS Steamship 17.V.22. good condition. 1923 card firm CENTRA with 50h issue Chainbreaker green with perfin LIGA Maxa L20, CDS Děčín 27.VI.21. good condition. 1925-26 2 pcs of cards with additional-printing Reichenberger Messe with 50h T. G. Masaryk Neotypie (gravure-print) with perfin RM Maxa R33, CDS Liberec 11.VII.25 and 3.VIII.26. Without damage, every card other. 1929 whole invoice Joseph Bartoň and sons from Náchod with revenue 1CZK and perfin J.B.S., Maxa J17, date 5.6.1929. Vícebarevný additional printing, fold, good condition. Decorative. 1929 whole invoice Joseph Bartoň and sons from Náchod with revenue 40h and perfin J.B.S., Maxa J17, date 27.6.1929. Vícebarevný additional printing, fold, good condition. Decorative. 1929 card firm Orenstein and Koppel franked with. 2 pcs of stamp. Coat of arms with perfin OK Maxa O10, MC Prague 11.XI.29. Without damage. 1930 4 pcs of address cut-squares from newspaper wrappers franked with. newspapers. stamp. Sokol 10h or 2x 5h with perfin JO, firm J.Otto Prague, Maxa J80. CDS Prague or Královské Vinohrady Various quality copy-print cancel. also margins stamp. 1930 heading envelope commercial fire-fighting corps f.. Herman Pollacka with 60h T. G. Masaryk with perfin H.P.S., Maxa H41, CDS Steamship ?, incomplete print. good condition. 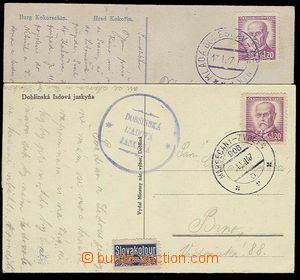 1930 response envelope to Austria Sklárny in/at Nové Sedlo by/on/at Loket with Pof.254, 258 with perfin "G.N." Maxa G28, train post Plzeň - Prague 8.XII.30. Envelope in upper part cut, commercial label on/for back flap. 1931 advertising PC for typewriter with additional-printing firm M.Munk, with 50h T. G. Masaryk with dvojitým(!) perfin M M, Maxa M30, CDS Police n./M. 4.III.31. good condition. 1931 advertising PC for typewriter with additional-printing firm M.Munk, with 50h T. G. Masaryk with perfin M M, Maxa M30, CDS Police n./M. 10.II.31. good condition.